Knicks Head Coach Mike Woodson has been fined 25 thousand dollars by the NBA after exercising his Freedom of Speech and refusing to tolerate utter mediocrity criticizing NBA Referees. Woodson claimed that the refs “blew it” in a recent interview regarding Carmelo Anthony’s negated 4-point play vs the Rockets which would have given the Knicks a win, and once again expressed displeasure after another game-deciding call went against the Knicks in the final seconds of regulation in their game against Indiana. 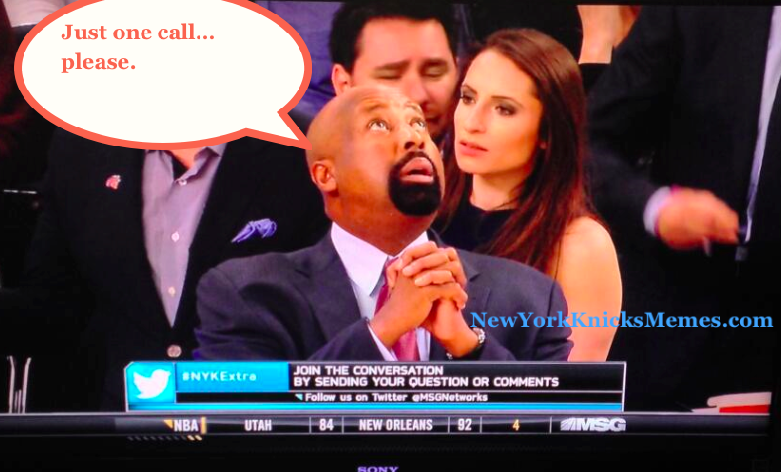 Woodson remarked that Carmelo takes a lot of contact but does not get calls like the other superstars in the league. The NBA is attempting to censor the coach, but he is absolutely right. LeBron James gets that call every single time. Not only does Carmelo get fewer calls than other stars (James, Kevin Durant, and James Harden, to name a few), he gets fewer calls than even the average NBA player. One could argue that a player’s skill level should not help them get calls (even though this is often what happens), but for somebody who takes as much of a pounding every game to get ZERO help from the officials is unacceptable. Paul George took a fingertip to the elbow last game and got a game-changing call. Melo got bumped hard by George on the ensuing play at the buzzer and did not get a whistle. Carmelo goes up strong regardless of whether or not he is hit, which may lead officials to believe there has been no contact. But it is the job of the referees to see the contact and make the call, and that has not been done so far. Carmelo is a great player, but there is little he and the Knicks can do if the officials aren’t going to regulate the opposing team. Mike Woodson was justified in his criticism of the refs and should be encouraged to stick up for his best player. Instead, he will be stripped of 25 thousand dollars, for the inexcusable offense of… talking. This entry was posted in Articles and tagged carmelo anthony refs, carmelo anthony refs memes, knicks coach, KNICKS MEMES, knicks refs, knicks refs memes, mike woodson, mike woodson fined on November 22, 2013 by Tommy Rothman.